Stavento House offers fully equipped rooms with private bathroom, balcony, insect screens and double glazing in aluminium for the complete sound and light proofing of the rooms. All rooms have central heating which makes Stavento House comfortable to stay in all year round. Each room is equipped with fridge, kettle and cafetière so you can prepare your coffee or tea yourself. 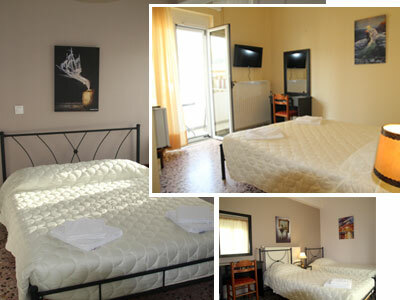 Rooms and communal spaces all offer free WI-FI, TV, toiletries, hair dryer etc. Two of the rooms have a fully equipped kitchen, electric oven, fridge with freezer, kitchen utensils for preparing meals. There is also a communal kitchen for anyone who wants to prepare their own breakfast or meal. Stavento House has a communal laundry room for laundering clothes or we can take this up for you (charges apply). Rooms are cleaned on a daily basis. Should you need your room cleaned more than once a day this is feasible (charges apply). Bed linen is changed three times a week and towels five times a week. Linen and towels can be changed more often if you request it (charges apply). Stavento House has a reception room with balcony overlooking the garden, where you can enjoy your coffee or drink, playing backgammon, listening to music or watching satellite TV. For those visitors who do not have their own transport we can pick you up from the port or drive you back to the port with Stavento House's private car. Our objective is to offer you a pleasant stay, in a family environment of traditional Greek hospitality in accessible prices.